Anchored in the harbour at Puerto Montt before dawn - started out as a dull drizzly day, but by mid-morning was sunny and pleasant. Lucky for us, because this area has 300 rainy days a year! Lush green as a result. The area was settled by German migrants in the 1850s, and that is evident in the buildings and nameplaces here. 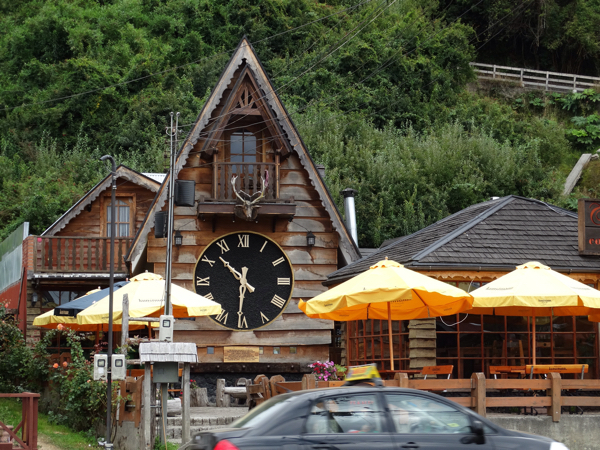 Puerto Montt takes its name from the native word for "four hills". The city of 200,000 is terraced on four levels up from the harbour. In 1960 most of the buildings were destroyed by a 9.5 earthquake and tsunami, so most structures are relatively new. They paint their homes in bright colours to compensate for the dreary weather. I decided to take the half day tour to nearby towns. On the way out of Puerto Montt we passed "he great social experiment". The national government has moved 50,000 people from Santiago to a newly constructed township, rent free with a promise of jobs. They work in the salmon industry and local factories - or else get welfare. Puerto Varas is a town on the shore of Lake Llanquihue, the third largest in South America and fed by glaciers from the nearby mountains. The Germanic nature is very evident here. On the hill is the German Lutheran area with its church and school. On the downtown lakeside is the German Catholic area with its church and school. The streets are all lined with roses, some 50 varieties, hence it is known as the City of Roses. It is primarily a holiday spot, offering fly fishing and other lake activities. Further around the Lake is Frutillar, "place of strawberries". Also very Germanic, with a wonderful colonial museum set in beautiful gardens. It features a number of different style German buildings, the most interesting being the Blacksmith's home and the Water Mill. All the buildings are timber, and there is a large concert hall built over the lake that is home to classical music concerts that draw people from far away. Across the lake one can see two of the many volcanoes of the Lakes District. Osorno is a picture copy of Mt Fuji in Japan, perfectly symmetrical and snow capped with glaciers. It is not dormant. Nearby is Calbuco which last erupted in 2015. It is "hot" and has no snow on it. A number of local villages were buried under the ash and have been relocated. 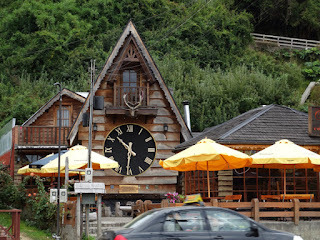 These towns are joined by Route 5, the international highway that runs from just south of Puerto Montt up the west coast of South and North America all the way to Alaska. Not a Sunday afternoon drive! Salmon farming is the main industry of the area. Six months in ponds, the 6 months in river, then six months in the ocean before they are harvested and processed for export. Also they export milk and cheese, Angus beef, and berries of all kinds to over 70 countries. They boast the lowest unemployment rate in Chile of under 3%. A name I kept seeing everywhere in Santiago and here is O'Higgins: streets, buildings, hotels etc. A strange name in a Latin country. Turns out he was of mixed Chilean-Irish ancestry, a large landowner and a leader of the 1817 war of independence against the Spanish. So regarded as one of the founders of modern Chile. Tonight I went a little more formal and dined in the 4 Seasons restaurant. Food and service excellent. Today's photographic record can be seen Here.